Since the definition of forage is edible plant parts that provide feed to animals, forages and livestock go hand in hand. But the degree to which an animal obtains its nutrients from forages varies. Dairy cows expected to produce massive amounts of milk are most intensely monitored. Providing feed to dairy cows is important. Sheep are next in the line for needing attention to forage nutrient needs followed by beef, horses, and wildlife. Though dairy cows need significant feed, the largest overall market is beef because they provide so many products and cannot produce on a continuous nature as milking cows can. About 30% of consumer expenditures are spent on beef and dairy products. The changes in society leading to new products (synthetic fabrics instead of natural fibers, cars instead of animal powered machines, and such) have caused the decrease in sheep and horse industries. Swine could be larger consumers of forages if the industry utilized free range feeding, but swine cannot as efficiently handle forages because of their monogastric digestive systems. 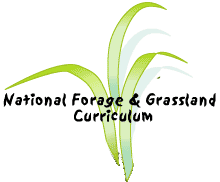 Another way to look at how forages and livestock go hand in hand is to look at the percentage of nutrients each type of livestock receives from forages with much of the remaining percentages being grain products which are also from the grass family. Sheep get 91% of their nutrients from forages, beef get 83%, horses 72%, dairy 61% and swine get 15%. These figures reveal several things. Swine handle other types of feed better because of their stomachs but utilize some grasses and legumes. Dairy cows need feed high in nutrients and need it provided in concentrated amounts for abundant milk production so grasses and legumes are supplemented with rations. Beef cattle can do quite well on grasses and legumes but the industry "finishes" cattle with grain to answer the demand of the public for tender meat with more, whiter fat which results when cattle are restricted from exercise and fed grain rations. Horses are used more as recreation animals or racehorses and often are given a more pampering diet. The value of forages can only be determined by livestock consumption and utilization which is very difficult to translate into a dollar amount. But it is clear that forages are not only crucial for life but also add comfort and beauty while allowing humans to do many other things besides gathering of food. It is important to view forages with an integrated perspective. Forages are a part of other things: filtering the water, cleaning the air, feeding livestock, reducing erosion, beautifying the surroundings, and providing habitat for wildlife.